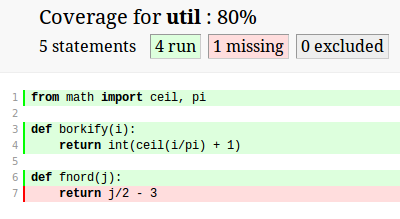 You might also want to check out trace that is in the python standard library (see  for Doug Hellmans take on it) or figleaf (see ). I made two basic python files (see below) and to test them I call the coverage method twice. First with the run argument and my filename and the second time with the report argument. This is just the kind of Keep It Simple I love! What else can it do? Before we look at more features - let's have a look at my silly little example. As you can see I added an if-branch for the case where I run the my_math as a stand-alone script. This branch executes methods func2, func3 and borkify. It does not execute func1 or fnord. After running your scripts with the run argument you can pass the xml argument to get xml output - I'll show a sample here. The interesting line is marked with 0 hits! This is thus the line we never tested. annotate: Annotate source files with execution information. combine: Combine a number of data files. erase: Erase previously collected coverage data. help: Get help on using coverage.py. html: Create an HTML report. report: Report coverage stats on modules. run: Run a Python program and measure code execution. xml: Create an XML report of coverage results. By adding the --branch flag to the run command you also add measurements of code branches. By adding the comment pragma: no cover the particular branch of code will not be measured.